Material: PP Plastic Pen Body and Fashion Design. Because of the fast drying of alcohol ink,each time after use must cover back in situation to prevent ink drying. Environmental PP material :the mark pen is in good sealing,so that Mark pen can save more time and sources. The second generation is dedicated to the development of a color Mark Pen,with a good price. 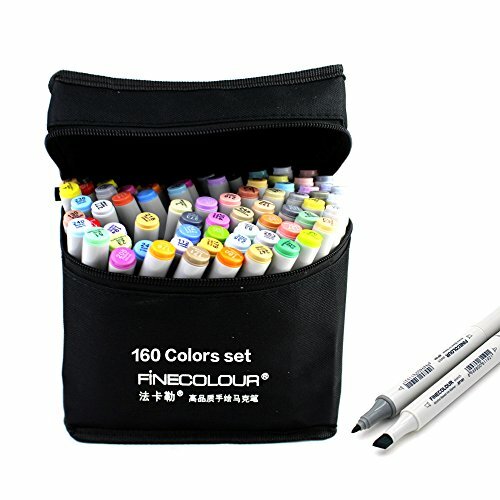 160 Colors,alcoholic quick Drying Ink, and coloring easily and uniformly. Each color ink has been carefully configured,and each color is specifically designed to provide BCDS encoding,and it can meet the needs of all kinds of designer. Specially provide the number " 0 "of the colorless ink Mark pen,and it is convenient for the designer in the work of the penetration because of color stratification. Because of the fast drying of alcohol ink,each time after use must cover back in situation to prevent ink drying.Environmental PP material :the mark pen is in good sealing,so that Mark pen can save more time and sources. Oblique and round pen's head : can provide a variety of line width of handwriting, and convenient for a designer to use. To ensure the quality of ink pen out smoothly, there are the corresponding color number for identification. If you have any questions about this product by FineColour, contact us by completing and submitting the form below. If you are looking for a specif part number, please include it with your message.